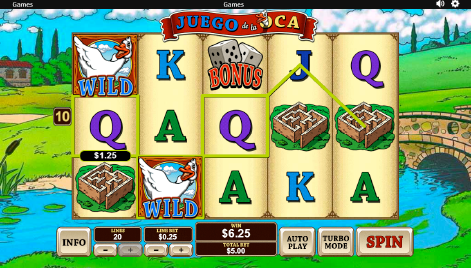 Juego De La Oca online slot game is now playing at Fly Casino. 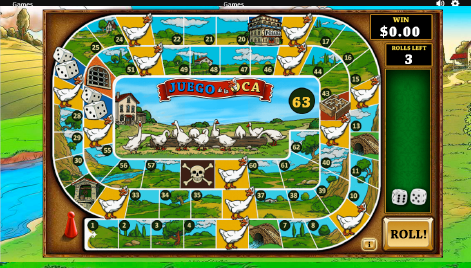 A Spanish voiced-over game, the game is themed on the centuries-old Game of the Goose board game. So famous in fact that this game was made into a TV series in Spain during the 1990’s. A great 5-reel, 20-line game, the classic board game is presented in the form of a bonus with a top prize of 100X your total wager. The famous goose of this game appears as a Wild symbol, which can replace for any other symbol but the Scatter. This video slot at Fly Casino has an Expanding Wild that is triggered when a Wild Golden Goose lands on reel five to win the Expanding Wild and a free re-spin. This is an awesome feature! Land three bonus symbols to trigger the board game bonus feature where you get to roll the dice to move around the board through the various obstacles and collecting cash up to 100X your total wager! Like the original board game, the bonus jackpot would be landing precisely on the 63rd spot. 120% Bonus up to 120.00! On Sunday from 00:00GMT until 23:59 GMT, all members will receive a 115% bonus up to 115.00 on your deposits of $/£/€30 or more. $30 gets $40 X 3. From 00:00GMT until 23:59 GMT, all members on their deposit of just $/£/€30 or more will receive a $/£/€40.00 bonus. Claim 3X! 133% Big Money Tuesday! From 00:00GMT until 23:59 GMT, all members are invited to receive a 133% bonus up to $/£/€266.00 on your deposit of just $/£/€30 or more or more.